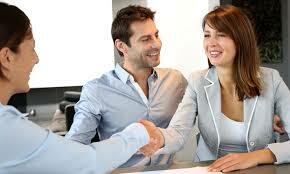 CALL 877-520-3937 WITH ANY QUESTIONS OR TO SCHEDULE A FREE CONSULTATION! 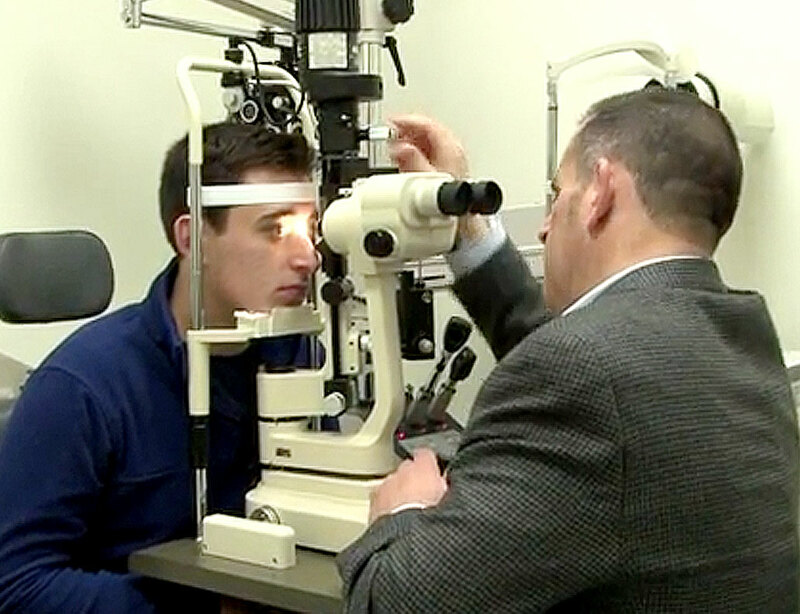 You will be quoted a price for surgery based on your prescription following a brief exam on an auto refractor. We will also discuss the procedures we offer, recovery periods and recovery details, preparation for surgery and financing options in that meeting, then address any questions you may have. 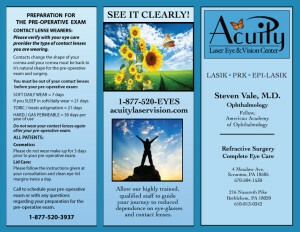 Your quoted price for surgery will include all follow-up exams for the first three months and your pre-operative exam. 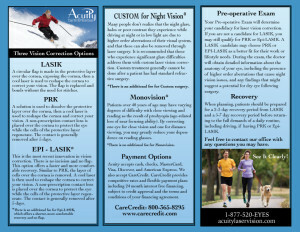 We will not determine whether you are a candidate for LASIK (2-3 day recovery) or PRK (5-7 day recovery) in the consultation. This determination will occur in your pre-operative exam. You may schedule your pre-operative exam (2 hours) to follow your consultation. Acuity offers 24 months interest free financing through Wells Fargo Health Care Advantage or Care Credit. Apply at wellsfargo.com/cardholders or CareCredit.com . You may want to call to apply to Wells fargo Health Care Advantage at 1-800-459-8451 or CareCredit at 800-365-8295 . 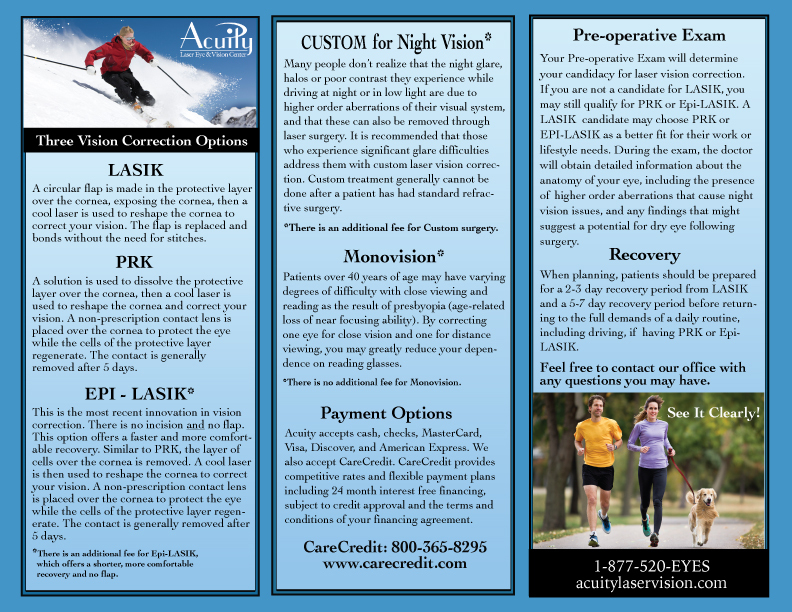 Your free, no obligation consultation will be an information session about the procedures offered at Acuity, including recovery times for each procedure offered. Call 877-520-3937 to schedule your free consultation. Dr. Vale of Acuity performing a pre-operative exam. You will be asked to pay an exam fee the day of your pre-operative exam, but that fee will be deducted from the price quoted for your surgery in your consultation. The balance will be due the day of surgery. Your pre-operative exam should be scheduled a minimum of one week before surgery or a maximum of two months before you intend to have surgery. You may call Acuity for the scheduled surgery dates available, or ask for dates during your consultation, in order to plan for your surgery and recovery. View this graphic for useful information. Be sure to verify the type of contact lenses you wear with your optometrist, to determine the number of days or weeks that you must refrain from wearing them to be prepared for your pre-operative exam and surgery. You will need someone to drive you home after surgery and during your immediate recovery period. Check Out Acuity On Social Media! 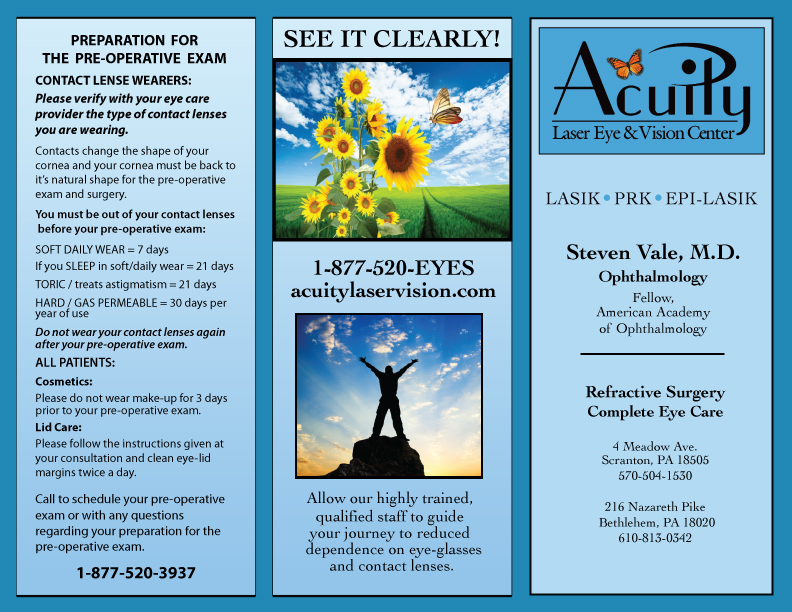 © 2014 Acuity Laser Eye & Vision Center. All Rights Reserved.